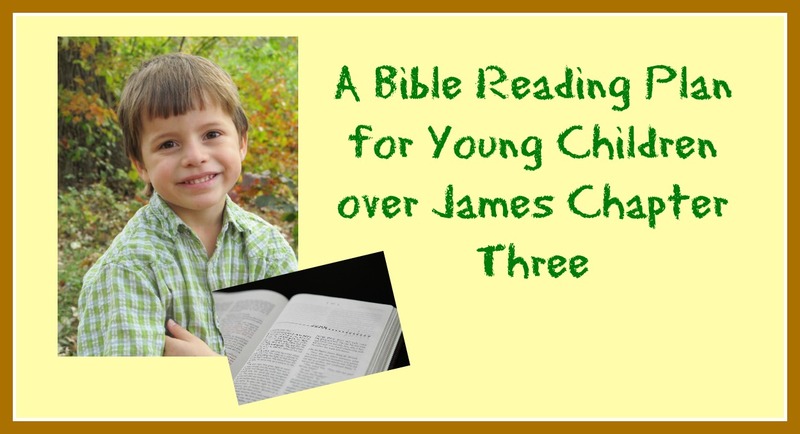 Check out this Bible reading plan for young children over the book of James! Welcome to Part Three of Journeying through James for young children! We are continuing our Bible reading right where we left off . . . on James Chapter 3. If you are new here, you might want to start your child with James Chapter One. If you have older kids, you can find their plan here. This Bible reading plan is based on The Book of James: A Hands-on Homeschool Curriculum. If you homeschool your children and you want a deeper study, check it out for a more intense yet fun hands-on and highly applicable study. There is also a special group study that goes along with these readings. This is perfect for families who want a deeper once-a-week fun family Bible time or for children’s workers who are ministering to children in a group setting. I am writing this curriculum for use with the children and teen ministry at the church where my husband and I serve. It is what we are currently using for our youth program and it contains ideas for games, detailed lesson times with life applications, and additional activities that include craft and snack ideas. I am making this available for you to use with your family or church and you can download it as a pdf here. If this sounds interesting to you, but you want to see what a lesson is like first, you can find a sample lesson here. 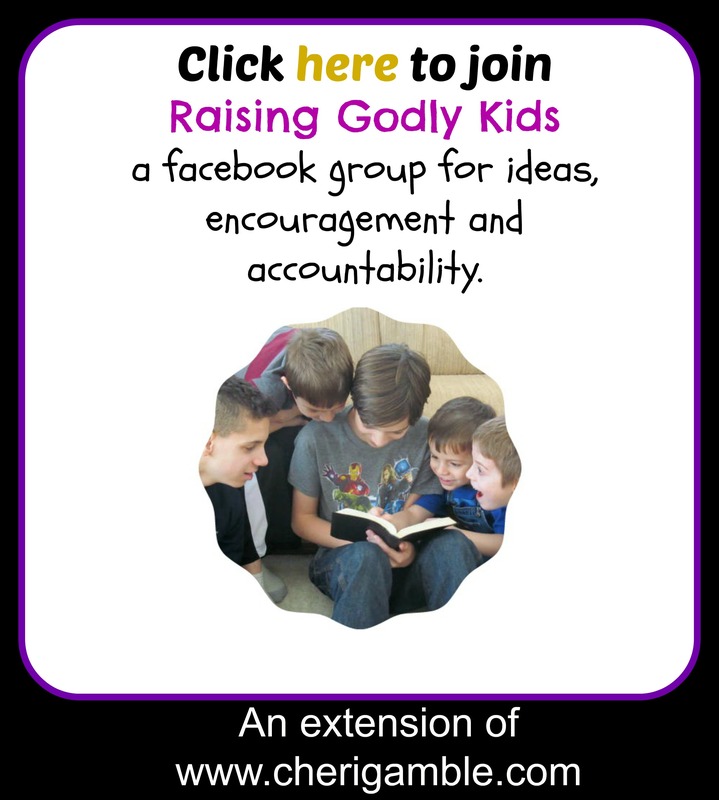 And, if you are participating in the Bible reading plans, you are welcome to join our facebook group for more encouragement, accountability and ideas as you raise godly children in today’s society. And now here is the Bible reading plan for James Chapter Three! ___ Day One: James 3:1-2. Verse 2 says that we all stumble in many ways. That means that we all do things that are wrong and make mistakes. What are some things that you do that you know you shouldn’t? Have fun helping your child learn verse 2 today. Read this verse to him as he tries to do several activities without “stumbling”. Can he repeat the verse after you as he hops on one foot? How about while spinning around in circles? Try as many actions as you can to see if he can keep from stumbling! (NOTE: Be sure you explain to your child what this verse means by stumbling before you begin your fun “stumbling” exercises!). ___ Day Two: Jeremiah 1:4-8. God had a special plan for Jeremiah! God wanted Jeremiah to speak God’s Words to the people around him . . . and Jeremiah obeyed and did what God wanted him to do. God has something special for you, too! Will you obey what God wants you to do no matter what it might be? Help your child make a craft to show that he will obey God. Cut a heart out of construction paper. Have him write his name at the top of the heart and then write the words “Obeys God” under his name. Give him stickers, buttons, crayons, markers, glitter, or anything else you have on hand and let him decorate the heart. It might also be fun to add a picture of him or let him draw a self portrait in the heart as well! Attach the heart to a craft stick and let him hold it up like a sign! ___ Day Three: Matthew 23:11-12. Matthew 23 is full of descriptions of bad teachers! If your child is old enough, you might want to skim through it with him and talk about the way the teachers were trying to make themselves look good – but they really didn’t care much about loving people as God wanted them to. Stress that God wants us to love Him and share His love with others, and one way we can do this is by being a servant! Help your child come up with some practical ways that he can serve those in his own family today! ___ Day Four: 1 Timothy 3:1-2. A person who teaches others about Jesus needs to live like Jesus! Make a special craft with your child to help him think of the qualities that he should have in his life in order to be like Jesus! Make an outline of a cross on a piece of paper. Then give your child several old puzzle pieces. On the blank side of the puzzle pieces, write words that he provides that describe how he can be like Jesus (for example: love others, be kind, share, obey, etc.) Then have him glue the puzzle pieces in the outline of the cross. Let him decorate the rest of the page and encourage him to be like Jesus every day! ___ Day Five: James 3:1-2. Help your child make a card for one of the leaders or teachers from your church. Be sure to give the completed card to that leader! ___ Day One: James 3:3-5. Our tongue can get us in a lot of trouble! Sometimes we say things that we shouldn’t, don’t we? Make a tongue snack today to remind you of how important it is to control your tongue! ___ Day Two: Daniel 4:28-33. King Nebuchadnezzar made some pretty big boasts with his tongue, didn’t he? What happened to him? God humbled him to the point of EATING GRASS! Make some green spagetti today to remind you of what happened to King Nebuchadnezzar! ___ Day Three: Acts 12:20-23. What happened to King Herod? Why? Make a worm craft today or eat a snack of gummy worms to remind you of what happened to King Herod. Find some great ideas here. ___ Day Four: 2 Corinthians 10:12-18. The only time it is okay to boast is when you are boasting about JESUS and what He has done for you! Spend time today BOASTING about JESUS!!! Here’s a great song to help you sing about how GREAT is our GOD! ___ Day Five: James 3:3-5. Use your tongue for good this week. Visit an elderly neighbor and spend time talking with her and building her up! ___ Day Two: Genesis 11:1-9. God gave us all different languages at the Tower of Babel . . . but He doesn’t tell us WHAT to say! We are the ones who decide what we should say! What are some things that we SHOULD say? Draw a large tower on a piece of paper and then cover it with words that are nice to say (such as “I love you”, “Thank you,” “Please”, “I’m sorry,” etc.) You could also write these words on the side of blocks and then make a large tower with those blocks, saying each word as you add it to the tower. Then, talk about how one bad word can really hurt other people and tear them down! Knock down the tower to demonstrate this! ___ Day Three: Matthew 12:33-37. The words we say are VERY important! Show your child two fruits – one that is rotten and one that is fresh. Would you like to eat a rotten fruit or a fresh, ripe fruit? Guess what? When we say bad words, we are like this rotten fruit – yucky and needing to be thrown out! But God can help us control our tongues and say good words, and, when we do that, we are like this fresh, ripe fruit that everyone wants! Eat a nice snack of fresh fruit together. ___ Day Four: Colossians 4:6 & Ephesians 4:29. What do these verses tell you about your speech? Your words can either be like SALT, where they serve a good purpose and “taste” good, or they can be like poison, where they hurt the ones who hear them. Which kind of words do you speak the most? Make a salt painting today to remind you that your speech should be like SALT and not POISON! ___ Day Five: James 3:6-8. Use your tongue to build people up this week!!! Practice saying words that are GOOD and KIND, and then make sure that you say those GOOD and KIND words to others! Make a fun snack that uses salt as a seasoning to remind you of how GOOD your words should taste! A great snack to make would be a pretzel. Find a recipe here. ___ Day One: James 3:9-12. Any time we are mean to other people or say mean things to other people, we are cursing men. People were made in the image of God and we need to treat them that way! Make your own veggie people snack and discuss how people are special creations of God! ___ Day Two: Genesis 1:26-31. When God created people, He created them special! They were created to be above everything else that was created. They were the ONLY ones created in God’s image! How should knowing this affect the way we treat other people? Have your child sit in a chair in the middle of the room. Then give everyone else sticky notes and a pen. Everyone needs to write one thing that is special about that child on the sticky notes and then stick the sticky notes on the child. Let every child in your family have an opportunity to sit in the chair . . . and give yourself that same opportunity! Emphasize the importance of blessing people and not cursing them! ___ Day Three: Luke 6:39-45. Our heart controls what we say! What kinds of things are you putting in your heart? Draw a large heart on a piece of paper. Then “fill” that heat with pictures or words that illustrate what we should fill our heart with. End the activity by eating a bunch of candy hearts! ___ Day Five: James 3:9-12. Make a poster encouraging people to use their tongues to build up and not to tear down! ___ Day One: James 3:13-15. Did you know that when you have good behavior, you show that you are wise? What are some ways that you can have good behavior? Make a “helping hands” book. Trace your child’s hands on several pieces of construction paper. On each hand, have your child write, draw, or glue pictures of ways he can do good. Punch a hole in each hand and let your child put yarn or ribbon through it and tie it together to make a little book. Read through the book together, emphasizing that one way we show we have wisdom is by the way we behave. Abigail showed her wisdom by her kind and gentle response to King David. You can show wisdom by being kind and gentle, too! Make a “hug” craft to give away as a way to be kind. ___ Day Three: Acts 5:1-11. Ananias and Sapphira were not very wise! They were selfish and they lied! Being wise means always telling the truth! Make this telling the truth craft from Crafting the Word of God. ___ Day Four: 1 Corinthians 1:18-31. Some people think that the CROSS is foolish . . . but we know that it is the CROSS that makes us wise. Spend time thanking God for the message of the cross today. Make a cross snack and share it with a friend! ___ Day Five: James 3:13-15. Are you a wise person? Show it by your good behavior! Make sure that your behavior shows that you are wise this week (and always)! ___ Day One: James 3:16-18. What kind of fruit are you sowing? Does your life have the qualities of wisdom that are listed in these verses, or are you growing something else? Ask God to help you grow good things!! Make a fruit salad today as you talk about the fruits of wisdom! ___ Day Two: Genesis 4:3-8. Cain was jealous of Abel and acted in a way that was certainly not wise. He let his jealousy take over and, as a result, disorder ruled – just like James said! What are some things we can do to help us not be ruled by sin? Draw a picture of several fruits and on each fruit, draw or write one way that you can keep sin from ruling in your life. Cut them out and put them together to form your own picture of a fruit salad! ___ Day Three: Matthew 7:15-20. What kind of tree are you? Are you producing good fruits or bad? How can you produce good fruits? Make a fruit tree craft today. Play fruit of the Spirit bingo. ___ Day Five: James 3:16-18. Make a fruit basket and deliver it to a neighbor or another person who could use the encouragement. Let it remind you to work on the FRUITS of wisdom in your own life! And to end James Chapter Three, here is the video my boys made. This time I was gone when they made it . . . this is TOTALLY their creation. Watch at your own risk. Are you finished with James Chapter Three? It’s time to begin James Chapter Four!